How do you get to know a robot? Researchers from Carnegie Mellon University are betting that putting humans and robots on the same soccer team will encourage the kind of cooperation that leads to understanding. The researchers have made a human-size version of their soccer-playing robots by basing the robots on Segway scooters, and they are working on a set of rules for Segway soccer, a game designed to be played by mixed teams of the robots and humans riding Segways. The project is designed to allow researchers to look at human-robot interactions in which humans and robots are on nearly equal footing, said Manuela Veloso, a professor of computer science at Carnegie Mellon University. The two types of players will have nearly the same acceleration, the same top speed, the same turning abilities, and will use the same ball manipulation device, she said. The setup makes it possible to explore questions like how and when humans and robot should communicate, and how they should divide a common task, said Veloso. "There are many really interesting challenges here that we now have the opportunity of investigating," she said. This promises to translate to any application that requires multiple robots to work with people in real-time, said Veloso. Examples are autonomous robot vehicles sharing the roadway with human-driven vehicles, robot building construction crews, search and rescue operations, and space exploration. These tasks all require real-time decision-making and action, she said. The preliminary set of Segway soccer rules calls for human players to carry devices that allow them to communicate with the robotic players. The players will use a size five soccer ball, but for safety's sake, dribbling is not allowed, only passing. And to encourage human-robot interaction, the sequence of passes leading to a goal will include at least one robot and one human. The game will be played on a soccer field proportional to a standard soccer field, but scaled depending on the number of players. The Segway base's dynamic balancing ability enables human-size robots because it allows a relatively small base to support a human height. "It's dynamic balancing also creates interesting effects," said Veloso. "We need to worry about obstacles not just from the viewpoint of hitting them, but also because the robot might fall over," she said. At the same time, dynamic balancing creates compliance -- where you can push the robot and it backs away smoothly, Veloso said. The researchers designed a pneumatic ball-handling mechanism that enables the robots to kick the ball, and a second mechanism that prevents the ball from going under the Segway base. The human-size soccer robot also has a vision camera and algorithms that allow it to to recognize and track the soccer ball in the variable light conditions of the outdoors, said Veloso. The robot contains pair of laptop computers, one to processes images from the camera, and another to run algorithms that allow it to select an action. The researchers have also developed a computer infrastructure, including a graphical user interface, teleoperation programs, and logging programs, that allows them to quickly develop and evaluate robot control algorithms. "The GUI lets us see what is going on inside the robot's head, teleoperation allows us to manually drive the robot around, [and] logging allows us to record sensory data and play it back at a later time," said Veloso. And to teach the robots to play soccer, the researchers developed skill-learning techniques that involve teleoperating the robot through a sequence of motions, said Veloso. "We record these motions and play them back on command," she said. "We can record the complex motions involved with, say, kicking a ball, and then reproduce them when the robot needs to kick." This replaces the need to work out a complex program for kicking, she added. The Segway soccer robot is fully autonomous, said Veloso. "It can reliably follow a ball and effectively kick it," she said. 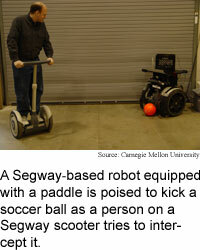 The researchers are working on finalizing the robot structure and the Segway soccer rules, said Veloso. On the robot side, the researchers are working on transferring the soccer-playing software designed for smaller robots to the Segway, improving the robot's ability to avoid obstacles using vision as the primary sensor, and adding the technology that will allow humans to send commands or messages to the robots, said Veloso. The robot already has the capacity to speak, she added. Once this is done, the researchers will begin studying human-robot interactions by observing how they interact in playing Segway soccer. Robots designed for specific applications could become practical in 5 to 10 years. Robots that interact with other robots and humans in general applications will take longer -- at least 20 years, said Veloso. The project is one of a dozen projects at universities and government labs around the country that involve building robots on Segway bases. The projects were initiated by the Defense Advanced Research Projects Agency (DARPA) Mobile Autonomous Robot Software (MARS) program. The research was funded by the Defense Advanced Research Projects Agency. Veloso's research colleague was Bret Browning.